NIA CHARLESTOWN NEVIS (November 18, 2014) –The matter of dialysis is firmly fixed on the “to do” list of the Nevis Island Administration (NIA). Deputy Premier of Nevis and Minister of Health Hon. 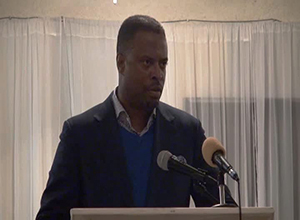 Mark Brantley gave that assurance when he delivered remarks at the Nevis Renal Society’s annual Gala Memorial Awards Dinner. “I want to commit as Minister of Health and commit the government, tonight, to the Renal Society and to the Nevisian public, that the issue of dialysis remains firmly fixed on our ‘to do’ list and that we would hope to have that become a reality in the coming year. So we are working assiduously towards that. The gains that we have made, we hope, will not be eroded by idle chatter but that we may together continue to work assiduously towards achieving a healthier Nevis for all,” he said. The Health Minister noted that he was aware that the issue of dialysis had attracted much attention on the island but it was a matter that the NIA continued to work on. “That issue remains an issue that we are working on, an issue, however, that we as a people have to appreciate that while we seek to get to the same goal, we may well take different routes to get to that goal,” he said as he pledged to work with the NRS to achieve their common goals. “I want to commit to you publicly, as I have done privately, the channelled cooperation of the Ministry of Health, in seeking to achieve with you some of your critical objectives,” he said. Mr. Brantley described the society as one of importance to the people of Nevis and one with which he sort to forge a relationship. “I feel that this organisation, the Nevis Renal Society, is one of critical importance to the people of Nevis. It is an organisation, as Minister of Health, I sought to cultivate a relationship with because I recognise what they bring to the table, in terms of their organisational skills, in terms of their capacity, in terms of their knowledge of all things kidney, and so for me it was rather important,” he said. The Health Minister also congratulated the organisation for its longevity. 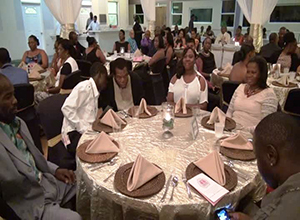 “The Nevis Renal Society…has been at this now for 15 long years. They ought to be commended for the work that they have done and the work they continue to do. “It isn’t easy in Nevis to do many things. It is difficult to keep organisations together and I believe that organisations that last as long as 15 years, demonstrate the commitment of those who are a part of it. For those who are the executive also for those who support the Renal Society, I would wish to congratulate you all for keeping the society going and based on its platform this evening, for continuing to demonstrate in word and in deed, that kidneys are our best friends and that we need to maintain the health of our kidneys and that the Renal Society is doing very valuable work here on the island of Nevis,” he said.